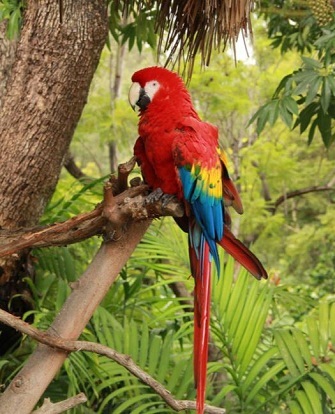 This site has numerous interesting and amazing tropical rainforest facts. The information on this site is formatted as list of information making for easy reading for kids and adults alike. You will find information on where the tropical rainforests of the world are located, rainforest animals, rainforest plants, tribes found in the rainforest, and how these forests have distinct layers. There are facts listed about the Amazon Rainforest, the rainforest found in Africa, South America, Central America, Asia, and other areas of the world. We cover how and why the rainforest of the world are threatened by deforestation and the consequences to the world as a whole. This main page has a list of basic rainforest facts; please see the other pages of this site for more specific information about certain aspects of this amazing biome. Click here for a great selection of Amazon.com tropical rainforest books. Tropical rainforest are warm and wet. This biome is characterized by a huge diversity of plants and animals and by high amounts of annual rainfall. These regions typically have annual rainfall of 50-260 inches (125 to 660 cm). The temperature in a rainforest rarely gets higher than 93 degrees Fahrenheit (34 degrees Celsius) or falls below 68 degrees Fahrenheit (20 degrees Celsius). Although rainforest cover less than two percent of the earths surface they are home to approximately one half of the worlds animals and plants. There is still a lot we do not know about tropical rainforest; most scientist believe there are still a large number of plant, animal, and insect species yet undiscovered. Many of the plants found in tropical rainforest are used to make natural medicines. For example over two thousand plants in this biome have been discovered to have anti-cancer properties. However the potential is much higher in that only one percent of the plant species have been analyzed for their possible medicinal properties. Rainforests play a crucial role in regulating the earths temperature and weather patterns. Rainforests are responsible for twenty eight percent of the world's oxygen production. Deforestation of rainforests due to human activities including logging, agricultural, ranching, and mining pose a huge threat to this biome. Tropical Rainforest are an important source of the worlds fresh water. In fact the Amazon Basin is the source of one fifth of the earths fresh water. There are four layers in tropical rainforest each is characterized by the plants that grow there and the animals that live there. These layers are the forest floor, understory, canopy, and emergent layer. See this sites Rainforest Layer Facts section for interesting information about each of the four layers including what animals and plants live there, and where each layer is located. Tropical rainforest are found in many areas of the world. They run along the equator between the tropics of cancer and Capricorn. They are found in Africa, central America, South America, Asia, Australia and pacific islands. Below is a list of some of the countries that have tropical rainforest in them. In Australia rainforests are found running along the east coast.